Judge(s): Tyler Cates, Modoc, Ind. 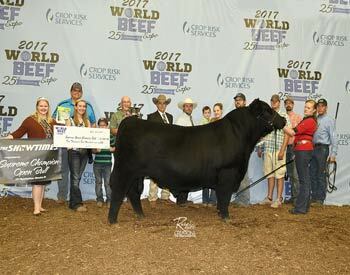 DAJS HH Bonfire 300 won supreme champion and grand champion bull at the 2017 World Beef Expo Roll of Victory (ROV) Angus Show, Sept. 22 in Milwaukee, Wis. Andrew Hodges, Montague, Texas, owns the March 2015 son of DAJS After Burn 714. He first won senior champion. Tyler Cates, Modoc, Ind., evaluated the 126 entries. 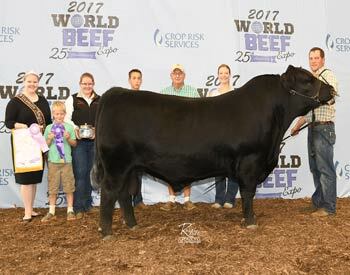 Mindemann Rock Candy 604 won reserve grand champion bull at the 2017 World Beef Expo Roll of Victory (ROV) Angus Show, Sept. 22 in Milwaukee, Wis. Andy & Leah Mindemann, Watertown, Wis., own the March 2016 son of Plainview Lutton E102. He first won junior champion. Tyler Cates, Modoc, Ind., evaluated the 126 entries. 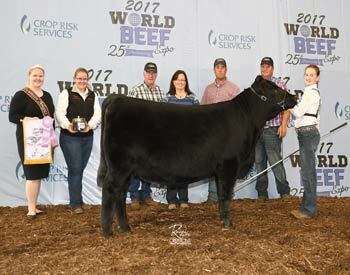 TopLIne FCF Proven Queen 161 won grand champion female at the 2017 World Beef Expo Roll of Victory (ROV) Angus Show, Sept. 22 in Milwaukee, Wis. Lauryn Mool, Lexington, Ill., owns the February 2016 daughter of Dameron First Class. She first won junior champion. Tyler Cates, Modoc, Ind., evaluated the 126 entries. 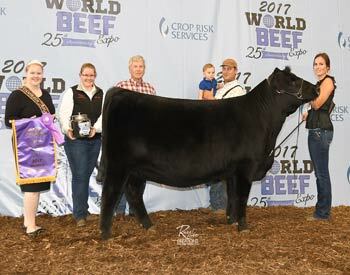 Dameron Northern Miss 6144 won reserve grand champion female at the 2017 World Beef Expo Roll of Victory (ROV) Angus Show, Sept. 22 in Milwaukee, Wis. Ella Brooks, Prophetstown, Ill., owns the April 2016 daughter of PVF Insight 0129. She first won reserve junior champion. Tyler Cates, Modoc, Ind., evaluated the 126 entries. 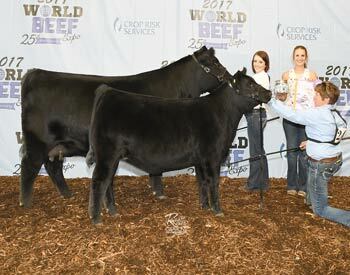 Top Line Lady 5103 won supreme champion and grand champion cow-calf pair at the 2017 World Beef Expo Roll of Victory (ROV) Angus Show, Sept. 22 in Milwaukee, Wis. Brady Schnelten, Rockbridge, Ill., owns the April 2015 daughter of PVF Insight 0129. A February 2017 bull calf is sired by Hurlbut OSU Final Exam 513 completes the winning pair. Tyler Cates, Modoc, Ind., evaluated the 126 entries. 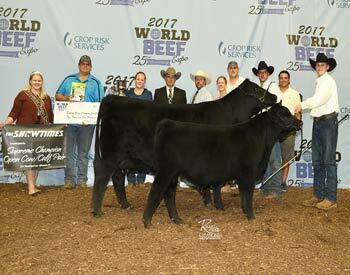 Lazy H Bar Forever Lady 517 won reserve grand champion cow-calf pair at the 2017 World Beef Expo Roll of Victory (ROV) Angus Show, Sept. 22 in Milwaukee, Wis. Gracia Ramp, Yates City, Ill., owns the January 2015 daughter of Dameron First Class. A February 2017 heifer calf sired by Silveiras Exquire 3544 is at side. Tyler Cates, Modoc, Ind., evaluated the 126 entries.